Sleeping away from us is a BIG deal for my little man. He attempted to sleep at my in laws a few months ago with my nieces but at bedtime got scared and wanted to come home, so he did. I wasn't sure how this 2nd attempt would go, I was a little nervous for him because I knew he was a little scared. My mom picked him up at 4pm yesterday and before he was leaving, he was hugging and kissing me and telling me how much he was going to miss me and half crying while saying it. I just kept telling him how much fun he was going to have! 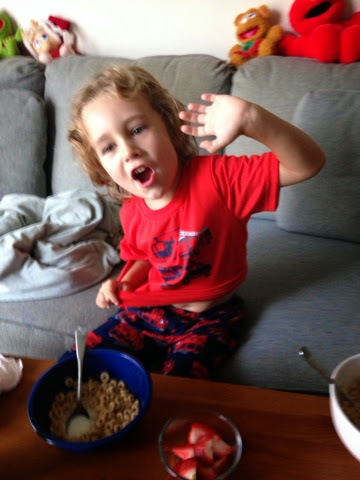 So off they went and my Mom provided multiple updates throughout the night, she said he would go back and forth with wanting to stay and wanting to go home, but eventually he went to bed and earlier this morning, I received this pic saying "Good Morning Mom!" Anyway, now onto what this post is really about - my sweet little Ella Bella who has now turned into the *middle child* - I can't really say just yet if it's true what they say about middle children, how they are forgotten about, etc, since I'm only a couple weeks in to this 3 kid thing, but even before Avery was born, poor Ella never really got the attention she deserved. Brayden is older and literally demands every minute of my attention and while I have tried really hard to be equal, I know it's just impossible sometimes to give Ella the attention I want to. So this sleepover thing was good for everyone, but mostly for me and my Ella - I was SO excited to spend some quality time with her! Thankfully Avery was very good about eating and then going right to sleep which gave me plenty of one on one time with Ella. 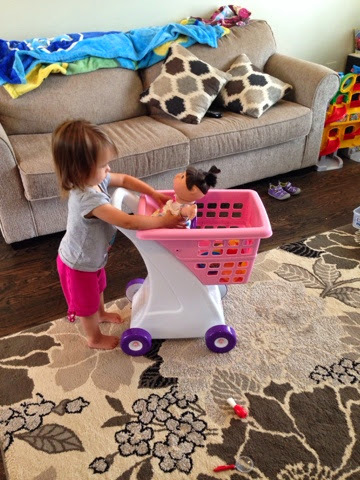 First I assembled her shopping cart my MIL bought her a while back, she was obsessed with it! 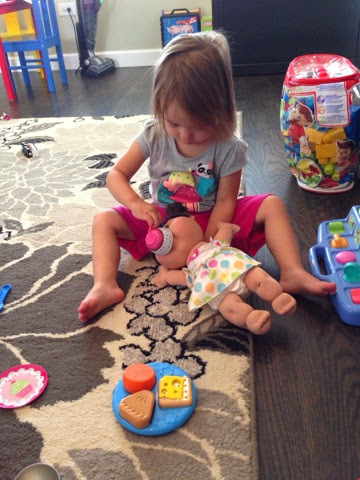 She then put her baby in it and would walk around the kitchen, playroom, entrway non stop, with every few seconds stopping to take her baby out and re adjust her. It was the cutest thing ever! 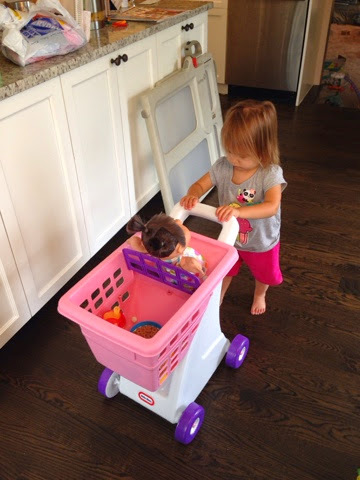 We then played kitchen and grocery shopping and had some tea - her baby joined us :) It was so cute to see Ella as a little Mommy to her baby, she was so good with her, it literally melted my heart! Even though it was wet outside from all the rain, we headed out to play - this picture is pure Ella - just so darn serious all the time! 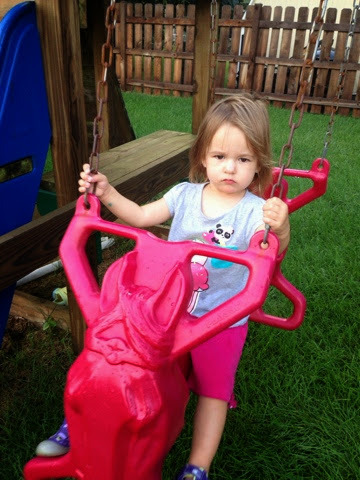 I can promise you even with this look, girlfriend was having a blast. 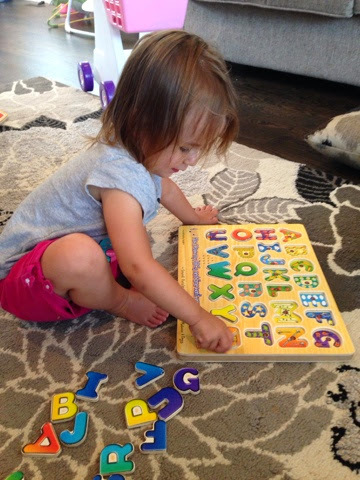 Next it was inside to do some puzzles - Ella is really obsessed right now with this alphabet puzzle and she amazes me at how well she does it! We ended our night watching some Mickey Mouse Clubhouse then it was off to bed for storytime. I can't remember the last time that I spent time like this with just Ella, it was so nice and much needed for both of us! Baby # 3 - 39 Week Bumpdate - This is it! !